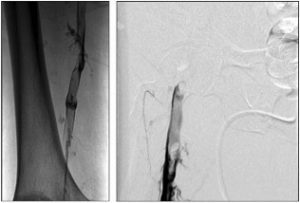 Deep venous thrombosis refers to clot formation in the larger veins of the body, most commonly the legs and pelvis. This can cause significant pain and swelling of the involved extremity and can also cause potentially fatal clots in the lungs called pulmonary emboli. 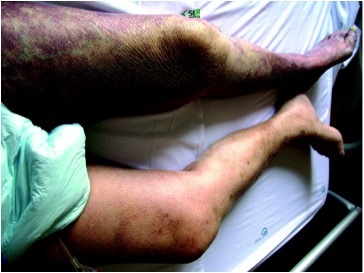 If the clot is very extensive, it can affect the blood flow to the legs and potentially cause limb loss and require amputation. The standard treatment for blood clots is thinning of the blood with oral or IV medications. Most patients continue blood-thinning treatment as an outpatient for at least 6 months. Usually over weeks to months, the body naturally breaks down the clot slowly and the blood thinner prevents new clot from forming. Having clot in your veins for a prolonged period of time can cause problems later in life such as post-thrombotic syndrome. This is a condition characterized by chronic leg pain and swelling. There are many risk factors for DVT. Some of these risk factors include recent trauma, major surgery, immobilization, and obesity. The diagnosis of DVT is made by symptoms, clinical exam, and an ultrasound that looks for clot in the veins. If the symptoms of pain and swelling are very severe or there is threatened limb loss, the clot in the vein can be treated by injecting a medication that dissolves the clot through a small catheter. 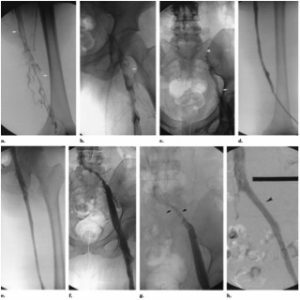 The catheter is inserted into a peripheral vein by an interventional radiologist and carefully guided through the clot for treatment. The catheter directed therapy usually lasts 24-48 hours while the patient is in the hospital. This restores flow through the vein, improving symptoms and reducing the risks of potential limb loss and post-thrombotic syndrome severity. The risk of bleeding complications is low in appropriately selected patients.